It's now exactly a week until the next Web Monday (on a Tuesday) event takes place at NetHouse in Stockholm, Sweden. So if you're in Sweden and interested in some or all of the above, please come by and chat to people with similar interests. I am positive that the future of web applications lies in simplification. Not simple as in too few options, or not very smart, but simple as in easy to understand. The simplicity/complexity debate has mostly been debated on behalf of different languages, where ease of use has been pitted against (developmental) scalability and the verbosity of safety-measures and meta-data has been clashing with implicit information and quick deployment. Instead of looking at which language offer the most suitable properties to development, I thought it interesting to instead look at what kind of protocols can be used, or created to simplify (in this case) Web-based applications. Why so? Well, even the frameworks being used (Web-based (Generates the client (html/js) on the server for every action) or resource-based (respond to RESTive accesses and/or rpc calls from a separately downloaded html/js client) are in most cases tied to their implementation languages, with the possible exception of Rails becoming a de facto standard over almost the whole playing field (Trails, Grails, Symfony, et.c.). But the power of Rails (from my admittedly shallow experience) is mostly due to either the expressiveness and clarity of Ruby itself, or from the strict opinionation when it comes to file structure, database management and mappings, et.c. Rails is still in some parts 'just' another JSP or ASP, in that it allows, even encourages mixing of presentation and logic, wise. I know that there are a lot of RESTive parts to Rails, but I haven't had time to try them out. By what I've read, though, they seem to be more on the right path. Much of the comments in the debate I've more or less started around the End of Web Server Frameworks center around the fact that people (this is my conjecture, of course) feel very naked without proper IDE integration and code generation, and most importantly readily accept any configuration-file hell and bloated Schrödingers codebases (which will resolve into either working or non-working client code only when you open the lid/actually run the service), as long as they don't have to suffer the indignity to actually _learn_ something that lives inside the browser. As I said, my conjecture. Maybe this standard exists already, or something like it exists, that can be reused for this purpose. If so, please comment or mail me, because I've been searching standards organization and the like the whole weekend. What do we gain by this? Well, it makes it possible to write generic widgets. Generic as in generically pluggable to any compatible server. And, quite frankly, it would make it possible to write generic clients for specific purposes, say resource editing, possible, so when you write your new fabulous service, you need only implement the common resource (tm :) description interface, and you can just pop in half a dozen existing clients that suit your purposes. And as it happens, I'm in the process of contacting people to see if we can get a working group around this, either loosely coupled or under an organization which is compatible with the purpose in mind. So, you might have thought it reasonable to avoid getting stuck in the XML swamps of the Server-side Web Frameworks, and instead separate the client in your system to run entirely in the browser. You might even have chosen a client library framework (like Dojo) to do so. Still, that is only half of the solution, since even with the best client side framework, it must have a server to play with (even though that server does not generate content as such). Theres also the IDE factor to consider. You'll probably be using Java on your server. You probably must, since you're actually designing a new web access 'portal' for an existing system. How could I guess? ****UPDATE 2008-03-31**** : Dylan Schiemann of Sitepen and the Dojo foundation have corrected me in this issue. Naturally it was SitePen, Mozilla Foundation, Nexaweb Technologies, Redfin, & SnapLogic that last fall jointly bought TurboGrid from the TurboAjax group. I don't really know what to say in my defense, sadly enough. I remember that I read several articles on the subject and how I could come up with my first take on this subject, and how I could get it this wrong is completely incredible. Very sorry about this!! 3) It's fully open-source under the GPL. 4) It uses Dojo 1.0 components, so you create your page(s) visually. 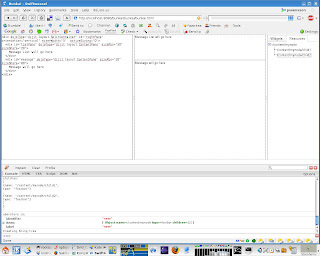 6) You can create services inside the IDE; WSDL, Database Queries or custom Java code. 7) It generates generic WAR archives, for crying out loud! There are a couple of other web-based IDEs out there which I quite like. TIBCO is one, but it can only use WSDL services, and lives only in the browser. And most of the others want either to host your solutions at their remote server farm somewhere, or possibly sell you a nice vendor lock-in solution that will hurt good in a couple of years. So WaveMaker really has guts to actually deliver what's needed for the .. I don't think customer is the right word, since it's free, but there you go :) But what I meant to say is that most companies focus on how to make sure that they secure their own position first, and then loosen that a bit here and there to make the proposition tastier for the customer. This is almost the other way around. Full disclosure before I go any further: I do some contract work for WaveMaker. However, I really like their approach and would not have taken up the work otherwise. What I mean with support on the server-side is tools or inherently capable systems that result in a proper RESTive service foundation that can be accessed by the client. WaveMaker supports not only the addition of existing services into the client for consumption, but lets you create them, and gives you a more cleanly separated server-side even if you choose other venues later on, which is even better. My first post on this subject described the general waste of resources that Server-side Web Frameworks incur, and the slideshow describing the alternative "Thin Server Architecture" had a number of very clear diagrams describing the alternative. This article meet the criticism I have received, question by question, to further clarify how to lower the cost of web application development. 1. c: Some frameworks are good for some things and some for others. Surely this "Thin Server Architecture" is just one choice among others. a: No actually, it is not a choice among others. It is the total removal of any web framework on the server whatsoever. That's what it is. It is "No View on the Server", and it is "Put the client on the client". If you consider "lowering your development and maintenance costs dramatically" a choice among others, be my guest. But I would generally consider that a question of whether to have a third ear at all compared to the question of where to put it. 3. c: The page will load in weird ways which users are not used to. Nobody will want to use a web application like that. 4. c: There is no need to go to such extremes. We already have AJAX support in JSF and it works well, for minor things where that kind of 'effects' are needed. a: Since the idea of using Ajax on a separate client (on the client) is opposite to generating the client on the server for every action, this Frankensteinian technique works well for nobody. It is a little bit like tying a jet fighter to a sinking Titanic. You will get a little lift, for a while, and then all will be engulfed by the next wave. 5. c: If you have to shuffle all data to the client using Ajax, it'll be too much data and the page will be slower that if it is created by the server-side web framework at once. a: Eh, hello? There is still the same amount of data, no matter how you get it over. Using Thin Server Architecture you get the page in place super-fast, then load and pre-load resources under the hood so that the application acts snappy when the user starts to interact with it. Oh, and you only ship the data after that. Måns Jonasson's research in this area shows a 33% decrease of server resources when starting to move View logic onto the client, from the server. 6. c: We have already invested so much money and training in our server-side web framework of choice, so we'll use it anyway, for all future. Nobody has the strength to ever learn anything again. We're not interested in lowering costs, we just want to do what we've done for years. Go away! Yaah! Also, there is supposedly companies who provide really great IDE support, of various flavours. What's more, there already truly amazing solutions for bringing this on big time . So my take on this is that this is the near future. If you don't think so, and have experience to disprove me, please comment here or mail me, because I'd be more than happy to hear what you have to say. This is from a talk I gave at Stockholm's first Web Monday, last week. In it, I try to describe the benefits of putting the client on the client and reducing complexity on the server. This is not available on the Bunkai PoC site, since it needs a backend which can provide an url that spouts JSON, but I'll think about lciensing Bunkai so that you can download it and make it run on your own backends. This was the hard part. You _do_ know that the fourth Dojo Developer Day start right now, as we speak, don't you? If you are in or near San Fransisco, head up to the GooglePlex, where Google are donating the use of some facilities for the event, but mail rsvp at dojotoolkit dot org, so people know you're coming. Believe me, if I were in San Fransisco, I'd be camping outside the doors. Actually, it would suffice with being in any of the Americas. As it stand, I sit in "Gamla Stan" in Stockholm, Sweden and is going precisely 20 km west (not near enough by a long shot) to cook dinner for my family. But that's life.